Heh, no, obviously it didn't, though it's not the first time somebody's claimed that sort of figure for a match. Sill, why stop when you're on a roll? Pick your own nonsense out of that lot, there's more than one to choose from. More of this rubbish to come. We can at least be sure of that. There's an amusing consistency here. If one accepts the nonsensical 605 million figure for players, it stands to reason there are others interested in the game but not playing it. This second figure, by the law of rounded numbers reflect reality, must be in the region of 400 million. If they’re expecting a billion online users then that'll require quite some hardware setup to support and that, in itself, would be a story. Probably they expect (and should make clear it's what they mean) one billion page requests (quite credible over the duration of the event) OR one billion separate visits. If a few tens of million people log on every day that will add up quite quickly - especially if/when the system crashes and people have to log in more than once a day. Also they are presumably going to count all views through chess24, chess.com, chessdom, chessbomb etc etc not just the logins direct at worldchess.com. However since the match is in the USA, the timings of playing sessions are presumably going to be critical to maximise visitors from Europe, Africa and Asia. I suppose that's a problem both for whoever is in charge of IT and the overall administrative budget. Do you believe your own propaganda and overspend, or do you base your estimates and resource requirements on the interest generated by previous top level matches and tournaments? Against that, the clash between Deep Blue and Kasparov back in 1997 was claimed to have had a then record internet audience. Agon is now claiming that only official broadcast partners can transmit the moves in real time. Maybe this will reduce the audience by 99% or more. 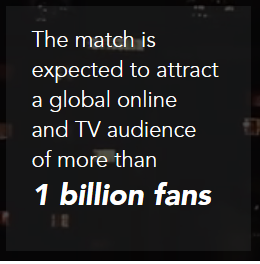 "The match is expected to attract an audience of one billion people." Technically, this statement is true if one person believes that one billion people will follow the chess! If the website connections don't know the difference between 'page hits', 'page impressions', 'visits' and 'visitors', they might decide that the biggest number (for page hits) is the number of visitors. For comparison, the wildly hyped Lee Sedol versus GoogleMind "go" match had about 100000 live viewers on YouTube in its first day. Maybe the Korean/Japanese/Chinese sites had more traffic, and maybe chess has a larger base, but can it multiply up to 10000x? According to ECU memo of 2011 (Copyright Commission), the plan was to get 10000 viewers paying 75 euros apiece for the next WC match. Alternatively, 1000 at 50 euros for a top level tournament. Dreaming? More and more confusing. It was not Agon that sent out letters, but "World Chess Events Limited", who claims to be the "official organizer" of the Candidates. Doesn't the FIDE contract with Agon mean anything (3.1a) in saying that Agon must be the sole and exclusive organizer? Or just doesn't FIDE care? I assume World Chess Events are a subsidiary of AGON? This site is operated by World Chess Events Limited, a BVI Company, having its registered office at Tropic Isle Building, P. O. Box 3423, Road Town, Tortola, British Virgin Islands (“Company”), which is the official organizer of the FIDE 2016 Candidates Tournament and together with its affiliates owns all the rights in the website and in the materials on the website. So it's an offshore company based in a tax haven attempting to restrict discussion of the Candidates games whilst they are in progress. Funny that a BVI company tries to use New York (state) law, with Moscow arbitration courts as the venue. One nice thing, about their YouTube page is you can see how many views they got. If I cared, I would go look at some other sport (darts? snooker?) to compare. According to Sutovsky, Aronian was misleading "hundreds of thousands" with his bogus post-game analysis. Only "up to a billion" this time around (but on average). He added that chess tournaments are starting to catch establishement’s attention. The game is "interactive, increasing its presence in the Internet and the mobile apps. Thanks to that average amount of chess fans is up to 1 billion. "